With the close of 2015 and the unexpected extension of the Solar Investment Tax Credit, US Solar companies can now look toward 2016 with a stable marketplace within which to operate. The US Solar economy continues to enjoy unprecedented growth, providing employment for over 200,000 solar workers and achieving a total installed capacity of over 20 Gigawatts to date, enough to power more than 4.6 million average American homes. So what more can we look forward to in the coming year? We asked Amicus solar co-operative members the following: What do you see as the major market opportunities for 2016? What new or innovative products or ideas may change your business or the industry? LightWave Solar installed 211kW at the Music City Center in downtown Nashville, and all of the solar generation is used on-site. Our region’s utility, the Tennessee Valley Authority (TVA), caps solar system size for Green Power Providers participants to 50kW, and while these systems produce great economics for their owners (TVA buys 100% of solar kWh at GSA-1 retail rate), many businesses are not able to materially impact their electrical consumption with 50kW of solar. For those businesses who would like to offset a larger amount of their electrical demand than TVA’s programs allow for, there is a solution. Larger users of power can install a larger solar array, and keep all the power it generates “behind-the-meter.” Doing so creates an avoided cost scenario (power produced = that much less power purchased), and will result in a fixed cost for all the solar generated for the next 25+ years. Consumers have embraced the idea of making bulk purchases of products in order to obtain a lower cost per unit, and this is why retail clubs like Costco are so popular. On a larger scale, solar self-generation can do the same, and add the incremental value of locking in an electric rate for the next 25 years that is less than what the utility charges today. With reduced solar prices, this model looks better than ever. Not all businesses are good candidates for solar self-generation, however, and there are a number of factors that go into making this determination. LightWave Solar reviews electrical usage and site information to help businesses decide if solar self-generation will work well for their facility. We look forward to building these larger solar arrays that make a bigger impact for our clients. Following states like Colorado, Minnesota, Massachusetts, and Vermont, the Public Service Commission of New York issued an order allowing Community Distributed Generation (CDG) projects in July 2015. Community DG allows anyone that cannot host their own solar project (or other approved generating technology) to benefit from renewable energy production through remote net metering. The host site where the system is located has a utility meter owned by the project sponsor, and project members “use” the energy produced based on an allocation percentage set by the sponsor. If you have a residential property with too much shade, or are a commercial entity without a viable space for solar, you can now benefit from energy produced at a remote site as if it was produced at your location without any hindrances. A Community DG sponsor may have a wide open sunny field, or rooftop on which they can install an array that produces enough energy to share with others in their community. Thanks to the CDG program anyone in the same utility zone as the project may sign on as a member and use the energy produced by the hosted array to offset energy consumption on their personal, business, or municipal account(s). This initiative will provide renewable energy to groups that were previously left out. Renters, homeowners with little tax appetite, and other tax exempt organizations will be able to purchase energy generated from CDG projects without owning the asset. New ownership models will develop as more and more community owned projects come on-line, and more and more project developers initiate projects. We are seeing a lot of interest and excitement as many people either want to host an array, or join on as a project member. This bodes well for consumers as they will have community solar options from which to choose, in addition to more traditional option of a self-hosted array. The first CDG projects in New York were allowed to interconnect in October, 2015 as long as they were in a strategic utility zone or contained 20% Low-to-moderate income subscribers. The market opens to all system and areas in May 2016. This year should see rapid growth in community shared projects as systems large and small hit the switch and start producing energy for their Members. ReVision Energy Solar Installer Noah Watson captured at a beautiful sunset! With the 30% federal tax credit extended 5 years for solar energy, 2016 has been reshaped quite immensely -in a positive way. While I think we (and the industry in general) was eager and ready to ramp up for the expected increase in demand that would result from an expiration of the tax credit, we’re much happier to focus on long term sustainable growth. That growth, we should mention, is still pretty brisk! ReVision Energy is proud to report that 2015 was our strongest year ever, and our company nearly doubled in size, installing close to 6 megawatts of solar and hiring over 45 new full time staff members. We anticipate comparable growth this year as New Englanders increasingly choose solar and complementary technologies to reduce their energy expenses and carbon footprint. As far as the future, we are keeping a keen eye on the rapidly evolving landscape of battery storage as we actually get our hands on products we’ve talked about for a while, such as the Tesla PowerWall and the Sonnenbatterie. We’re thrilled to be partnering with local electronics manufacturer Pika Energy for the introduction of the Pika Energy Island system, which offers our customers a Maine-made battery backup/micro-grid solution. We’re also really eager to help lead the development of electric vehicle infrastructure in the Northeast, and continue our strong business installing air source heat pumps to allow our solar customers to convert solar-powered electrons into BTUs! While we prefer to focus on our core business of installing and servicing the best solar technology in the world, it seems like politics gets mingled with our business quite a lot and we’re keeping a close eye on developments both locally and nationally as utilities and state government wrestle with integrating solar onto the grid in increasingly greater numbers. We believe that a transition to a 100% renewable energy powered economy is both inevitable and desirable; however we don’t expect this transition to always be smooth as entrenched interests struggle to cope with competition and policy struggles to catch up with the rapid development of technology. We see 2016 as the year when considerations for integrated home battery storage solutions will impact the US market in a meaningful way. Since early last year when Elon Musk introduced the Tesla Powerwall battery storage system, we have received numerous requests by clients that want to integrate storage with solar. In some markets, like Hawaii, adding battery storage to a solar array is already justified due to the new interconnection restrictions imposed to avoid solar generators from putting energy on the grid. Historically, there has not been a substantial financial benefit for solar generating residential clients to add storage in most Texas markets. We see that changing in the next few years, and because of this, Native is working now with Texas utilities and battery companies like Sonnen and Tesla to offer turnkey products and allow early adopters to add storage to their homes…now or in the future. One exciting aspect of these offerings is that they can be easily retrofitted with existing solar installations to provide backup power now for homeowners looking for security against a grid disruption. While back up power is a common application for storage, these products provide a lot more than just back up energy storage. They are a home energy management solution. These products can adapt and prioritize grid, solar, and battery power sources to minimize your electric bill. This is applicable now in markets that have time of use rate structures, and while these are still uncommon in Texas, utility rate structures will eventually change to reflect the realities of the new twenty first century grid. Here at Sunsense we are particularly focused on how new storage options will shape the industry. We have always had an “off-grid” department at Sunsense and have a high level of expertise in sizing storage for off grid homes and cabins. 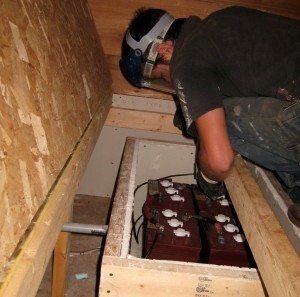 An interesting new trend lies in storage systems for residential grid tied homes as evidenced by the hype surrounding the Tesla Powerwall. Customers are interested in incorporating storage for various reasons. Some are interested in independence and disconnecting from the national energy grid, others want to use storage to manage the time of energy use from the grid so that they can purchase at lower rates and sell back at higher rates. Here in Colorado, utility rate management strategies make most sense for commercial entities, as a way to avoid high kW demand charges, but with these larger loads a lot more energy storage is required and the economics of adding batteries is not yet financially feasible. However as utility rates continue to rise and the cost of battery storage systems decrease, this will become an attractive investment for savvy business owners looking to control their energy costs. And at the larger end of the scale, it seems inevitable that utility companies will start to incorporate storage into the grid to provide a range of benefits from balancing intermittent renewable energy resources – solar only produces energy during the day – reducing transmission and distribution costs and shifting power consumption away from costly peak-load periods. All in all, solar plus storage is going to become more common and will bring new opportunity and added value to all solar markets from small residential to large scale utility applications.